You’re going to love this recipe for slow cooker ginger peach chicken. It only takes five ingredients and a few minutes to make. More importantly, it’s absolutely delicious and totally different from all of my other chicken recipes! 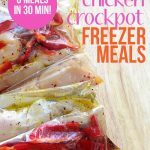 I love a good slow cooker chicken recipe. We eat my slow cooker BBQ chicken and chicken chili all the time, but I’m always looking for new recipes to make with chicken. 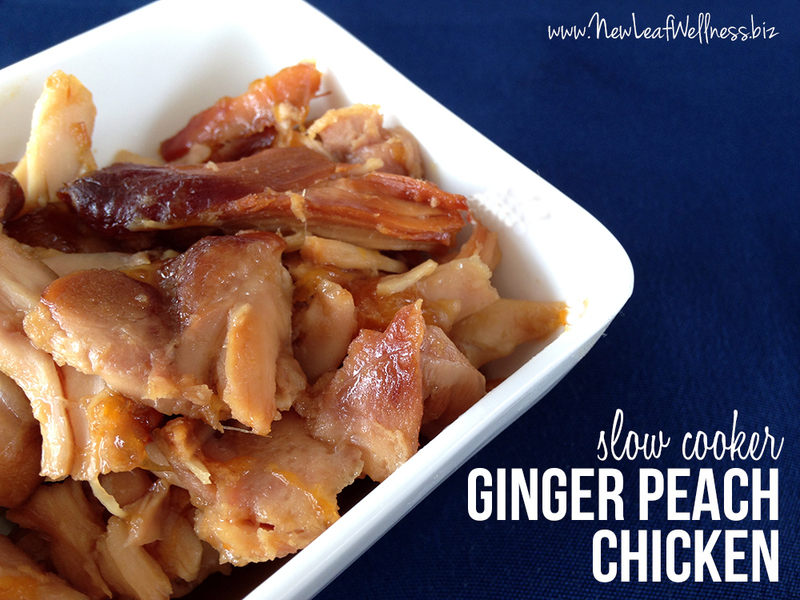 This slow cooker ginger peach chicken is sweet, delicious, and so easy to make! 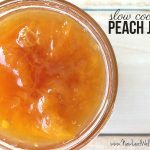 The sauce is made from peach jam, soy sauce, ginger root, and garlic. It gives the recipe an Asian-flare and makes it taste totally different than the other chicken recipes that I make (in a good way). In fact, I think I’m going to cook with jam in my slow cooker more often. If you’ve never cooked with fresh ginger root before, you’re in for a treat. It’s a beige-colored root sold in the produce section and it’s normally sold in small pieces. If you have any leftover after making this recipe, store it in the freezer for the next time you make ginger peach chicken, or add it to your next stir fry. Add chicken thighs to your slow cooker. In a medium-sized bowl, create sauce by adding peach jam, soy sauce, grated ginger, and minced garlic. Stir to combine. Add lid and cook on “low” setting for 3-6 hours or until the chicken shreds easily. (The cooking time will depend on the size and strength of your slow cooker). Shred chicken and return to slow cooker to mix with juice. This ginger peach chicken tastes great with brown rice and roasted green beans. Yum! I found this link from your Nine Freezer Meals page. To freeze this do you put all ingredients in a freezer bag or is there anything you add at the time of cooking? Just combine it raw in a freezer bag. 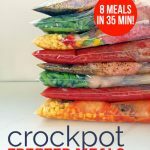 Also, if you look on the 9 Freezer Meals that Don’t Require Any Cooking Ahead of Time post, there is a printable recipe that includes the freeze/thaw/cook process step-by-step. I can’t seem to find those directions. When I click the link posted it just brings me back here. I’m having the worst time finding peach jam. I did find a peach fruit spread. How do you think that would work? Thx! Is the spread similar to a jelly? I think any kind of jam or jelly would work. I’ve also used apricot with success. I used peach preserves and it turned out delicious!! OK. Let me know what you think!